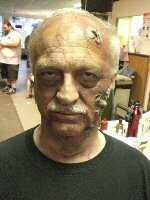 I have researched zombies for TV shows, articles, and books (e.g., Tracking the Man-Beasts, 2011), but on June 19, 2010, I became a zombie. 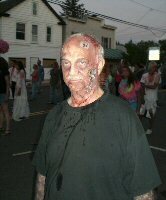 This was for a new horror movie, The Final Night and Day, produced by DefTone Pictures Studios (Hamburg, N.Y.) and scheduled for a March 2011 release on DVD. 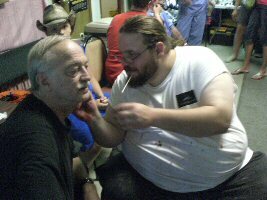 The special make-up (provided by Rod Durick and Tammy Janinum of Zombified Studios) automatically upgraded me from a mere extra to "hero" zombie (those with the best make-up being placed closest to the camera during filming).